All that glitters is not discipleship. Good Meetings. If folks leave saying, “Great meeting!” they may have missed the point. A great meeting does not mean people have been discipled. In fact, discipleship happens as much outside of official meeting times as within. Good Bible Studies. I believe this is the biggest fool’s gold in many groups. More study and more knowledge do not equal being discipled (see 1 Cor. 8:1-3 and James 1:22-25). It is part of the process, yes, but just because you have studied God’s Word as a group does not necessarily mean people are growing up spiritually. By the way, if the only time group members are opening their Bibles is in group meeting, that’s not real discipleship! Group Longevity. I’ve heard group members suggest that because they have been in a group a long time, they have been discipled. Yet it sometimes appears they are some of the more spiritually immature people I’ve been around. Groups, like individuals, can get into a plateaued state and not even realize it. They can drift along in their lukewarm state for years and years, not growing or producing any real fruit that lasts. This is dangerous: it’s to such people that Jesus said, “I never knew you” (Matt 7:21-23; also see Revelation 3:16). Group Talk. The apostle Paul said, “For the kingdom of God is not a matter of talk but of power.” It’s easy to talk a good Christian life in a small group gathering, but talk does not equal real discipleship, counting the cost, making the commitment, and following Christ with everything you’ve got. Discipleship requires taking off the masks, putting away falsehood, being real, transparent, and authentic with one another. That includes stuff like confession, accountability, acceptance, encouragement, admonishment, truth, and love. True discipleship leads to bearing fruit, fruit that will last. 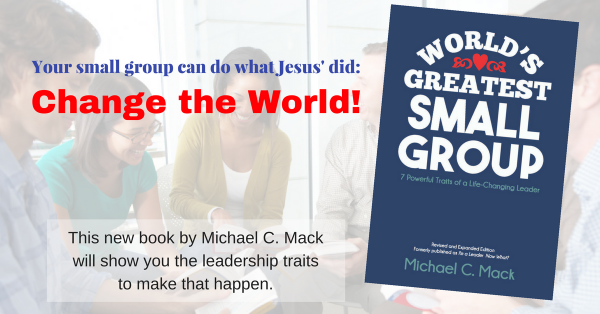 Groups that are really doing discipleship will by nature be missional. Ministry. This may seem antithetical to my last point, but a group that is doing ministry together does not necessarily equal a discipling group. Ministry flows out of a Christ-centered community that is growing in their relationship with Him. A Super Leader. I’ve said this often, but it is simply impossible for one person to disciple a whole group. Even Jesus didn’t try it. Instead, a Christ-like leader shares leadership with 2-3 others who share the shepherding and discipleship responsibilities. Unfortunately, too many of us are leading solo and not bearing fruit as we should. If this describes you, I encourage you to get a copy of my book, The Pocket Guide to Burnout-Free Small Group Leadership (Digital edition). By the way, one of the ways to identify Fool’s Gold is if you find it sitting right on top of the ground. The Real Gold of Discipleship usually takes a lot of digging, searching, and time. And it always includes a cost. Are there other Fool’s Gold I missed? What do you think?